ActionGroup - A D-Bus Gio::ActionGroup implementation. 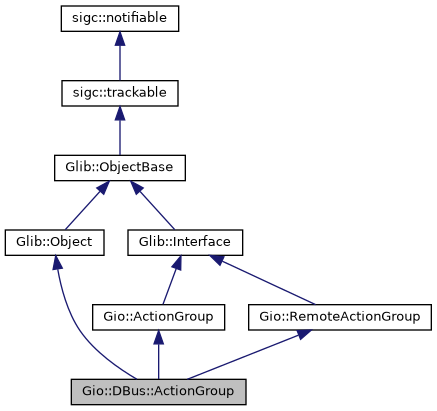 ActionGroup is an implementation of the Gio::ActionGroup interface that can be used as a proxy for an action group that is exported over D-Bus with Gio::DBus::Connection::export_action_group(). Obtains a Gio::DBus::ActionGroup for the action group which is exported at the given bus_name and object_path. The thread default main context is taken at the time of this call. All signals on the menu model (and any linked models) are reported with respect to this context. All calls on the returned menu model (and linked models) must also originate from this same context, with the thread default main context unchanged. This call is non-blocking. The returned action group may or may not already be filled in. The correct thing to do is connect the signals for the action group to monitor for changes and then to call g_action_group_list_actions() to get the initial list. bus_name The bus name which exports the action group or nullptr if connection is not a message bus connection. object_path The object path at which the action group is exported.